In the Philippines, restaurants or eateries selling goto can be found in almost any street. Putting up a gotohan can be daunting as you have to compete with a lot of business owners who can offer goto products in affordable prices. To stand out in a sea of competitors, Goto Believe owner Sandra Santiago decided to give her gotohan interesting and unique twists. 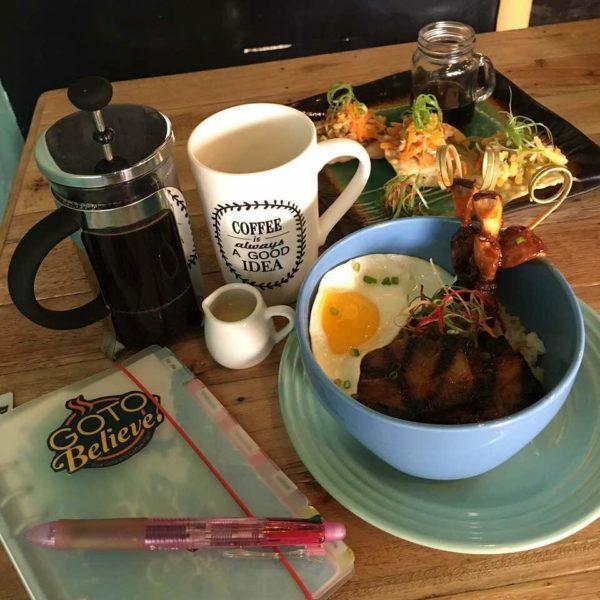 Located on a residential garage in San Rafael St. in Mandaluyong, Goto Believe has amassed a steady stream of customers since its opening in July. “Gusto naming mag-offer ng masarap na goto, hindi mahal, pero mahal tignan,” Santiago told ABS-CBN News. Santiago decided to give the traditional meat porridge a hipster spin to set her products apart from traditional goto. Instead of the usual bowl of hot goto served in gotohan, Goto Believe’s goto is presented ala gourmet but in an affordable price. True to what hipsters and millennials dig, Goto Believe offers delicious and Instagram-worthy food in reasonable price points. Unlike your typical gotohan, Goto Believe reflects hipster mindset and gives a hawker-like feel with its fun and interesting interiors that use bright colors like chartreuse mixed in with some light red and yellow accents. Santiago took advantage of her background in arts and put artwork on the walls, interesting wooden tables and chairs, as well as unique placeholders such as “Single”, “Taken” and “Hungry”. In a typical gotohan, you get to order the traditional goto and pair it with tokwa’t baboy or lumpiang gulay. But in Goto Believe, you have the choice to pair it with skewered meat like grilled isaw, pig’s ear, chicken heart, and chicken liver; lumpia; liempo; and egg. 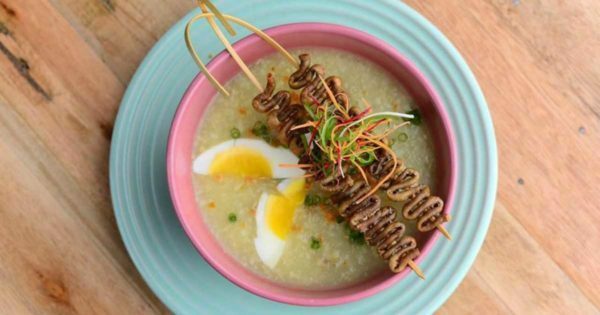 Goto Believe combines deconstructed traditional Pinoy street foods to come up with a one-of-a-kind combination. Offering plenty of options, Goto Believe serves wet and dry goto and offers eggs in six ways. Aside from offering grilled sticks, Goto Believe introduced the option of frying sticks to give skewered meat a different texture and flavor. For health-conscious customers, Goto Believe also gives healthier and vegetarian options. Don’t you find it hard to come up with an order when you’re in a big group? Goto Believe is making their customers’ lives less complicated with OMG (Oh My Giant Goto) which comes with eight toppings such as hard boiled egg, dilis, crispy wanton wraps, tenga, paa ng manok, isaw ng manok, chicharong bulaklak and bituka ng baboy.